In order to assess, evaluate and monitor the satisfaction levels regarding ALERT® products and services, we provide all our customers with a specialized team that implements a Satisfaction Evaluation method named “Five Evaluation Moments”. Based on a continuous follow-up methodology, which starts immediately once the contract has been signed (refer to previous figure), this model aims at identifying the customer's real expectations and needs. The obtained results allow us to improve our performance. To assess our customers' satisfaction levels, we created questionnaires and opinion cards which are processed in scheduled visits and carried out by us at the customer. Whenever necessary, we hold telephone surveys and meetings with user groups (Key Users). Once data is collected through questionnaires, opinion cards and telephone surveys, this data is processed statistically using advanced Business Intelligence and Data Mining tools. This way, and also with the integration of "Mystery Customer" projects, the efficacy of our methodologies employed in development, implementation, support and maintenance of the ALERT® product suite is periodically evaluated, which leads to an internal reflection over adopted practices, thus validating the efficacy of developed mechanisms and the adequacy of adopted strategies. In the pursuit of excellence and total satisfaction of our customers, ALERT's Customer Satisfaction Department, closely working with other teams, monitors the actions considered necessary to improve internal processes and ALERT® products. Should you need to contact us, please use the following e-mail address: customer.satisfaction@alert-online.com. In order to provide specialized monitoring once the paper-free status has been achieved, ALERT allocates a Customer Manager to each of its customers. This team is oriented toward understanding the needs of ALERT's customers. 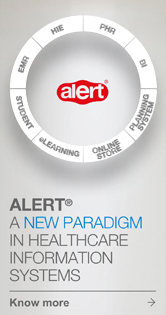 With an in-depth knowledge of the development strategy of the ALERT® product suite, the Customer Manager monitors, provides advice and promotes actions that ensure the customer's total adoption and satisfaction toward ALERT® products. In this manner, every customer benefits from a personalized service provided by its own Customer Manager, thus ensuring a continually closer and highly professional relationship. The Customer Management team takes on the mission and duty of monitoring and promoting its customers, and improving their communication links with ALERT, therefore ensuring that adopting the implemented solutions has been indeed the right choice to make. Aware of the critical work health environment in which it operates and the need for high availability of its products, ALERT provides its customers with a Support team that is available 24/7, 365 days/year and able to respond in a preventive and efficient way to the existing situations and demands. ALERT Support Department has adopted the best ITIL® (Information Technology Infrastructure Library) practices, using management tools and specific procedures, which ensure a quick and efficient response to customers' requests. This Department provides technical support to all ALERT® applications by using a remote connection – a VPN connection is needed –, where the bandwidth depends on the number of servers and workstations to support. With the ALERT Monitoring system, the structure, functionality and performance of ALERT® applications are monitored 24/7, thus enabling actions and preventive measures to be performed within the customer and preventing the occurrence of problems, which could, otherwise, have a negative impact on the application’s normal operation. The ALERT Monitoring system includes an indicators tool and information focus (NOC – Network Operations Center), thus ensuring the logic and benefits of a preventive application line, where tools and resources are specifically created for ensuring the preventive maintenance of all ALERT® products. These are convergent through a Call Center equipped with a Unified Messaging System, which gathers all communications received by phone, fax, e-mail and ALERT Helpdesk. Technical team specialized in ALERT® products and the technologies that support it, thus ensuring the assistance for technical incidents related to the functioning of ALERT® applications (technical failures or integration problems with other applications). Technical team specialized in the maintenance of ALERT® interoperability and operation with the applications being used in the customer environment. The ALERT Support Department approach regarding the constant monitoring of customers' needs assures the compliance with Service Level Agreements (SLAs). The priorities given are established according to a set of rules defined between ALERT and the customer. ALERT, which is in constant communication with the customer, will inform you (information is periodically updated) about the incidents’ reported status and deadline for solving them, and will focus on the compliance with the established Service Level Agreements. Should you need to contact us, please use the following e-mail address: suporte.cliente@alert.pt. ALERT provides an on-site training service that eases the process of going from a paper based environment to a paper-free environment. Named On-site Training, this service is provided mainly by clinical psychologists that support the management of the complex process of removing paper from clinical environments. The On-site Training professionals wear a uniform that distinguishes them from the other healthcare professionals.